Mr. Thompson, who is a professional natural sciences education specialist and who, earlier, spent seven years as education director of the nationally-renowned Teton Science Schools, was making vivid a phenomenon that many outdoor-oriented people suspect, but which has been hard to put a finger on. Many people assume or claim that because they don’t actually witness animals running away at their approach, then there must not be impacts, he said. Indeed, federal land management agencies, like the U.S. Forest Service, have been slow to respond to the impacts of growing recreation pressure yet as Thompson points out, absence of evidence does not equate to absence of impact. 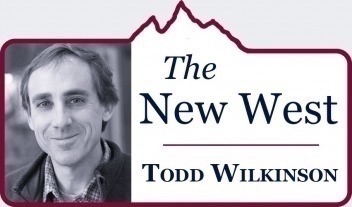 Right now in Jackson Hole there seems to be an awakening happening around the realization that wildlife displacement is happening, whether involving backcountry skiers invading habitat for bighorn sheep and wolverines, mountain bikers and ATV riders aggressively pushing for more trails, and the swarms of us increasingly heading up Cache Creek. 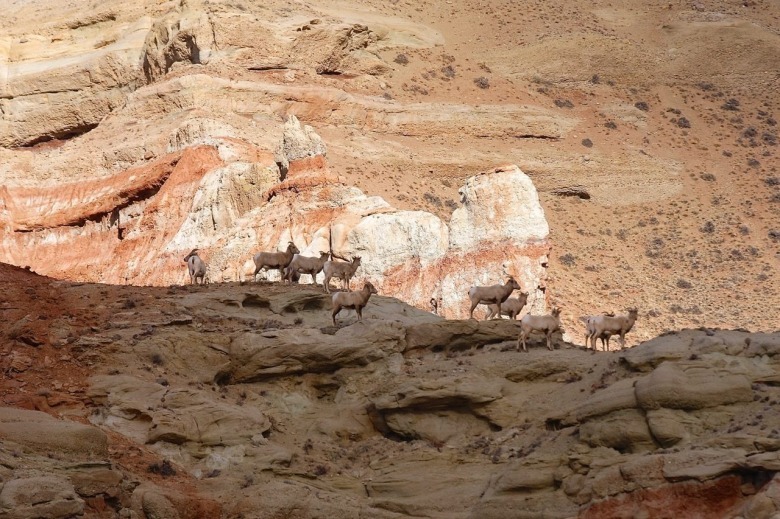 Thompson, who lives in Dubois, Wyoming, says his research into recreational impacts on wildlife was piqued by a push from commissioners in Fremont County, Wyoming to transform the 4,520-acre Dubois Badlands Wilderness Study Area, stewarded by the Bureau of Land Management, into a National Conservation Area. The change in classification is being advanced by mountain bikers who want to ride within the labyrinth of highly-eroded, geologically-surreal landforms that begin just outside of town. The terrain resembles what one might find in the badlands of South Dakota or the redrock mazes of Utah around Moab. Though thrill-seeking riders see badlands as a perfect new virgin playground, these outskirts of Dubois are home to things the Dakotas and Moab can only dream of having—a rich assemblage of wildlife. In addition to providing habitat for animals, soil disturbance caused by tire tracks across the exposed slopes is likely to leave behind visual scars that would last for decades, advocates of greater protection say. Thompson began pouring over the scientific literature on animal flight response to humans and as he printed out reports the stack on his desk took on surprising heft. 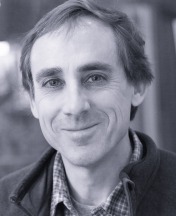 Not long ago, Thompson presented what he found at the Northern Rockies Conservation Cooperative’s biennial Wildlife Symposium at the Center for the Arts and a few days later at an event titled “the Ecological Impacts of Recreation on Wildlife & Wildlands” hosted by the Wyoming Wilderness Association and Jackson Hole Bird and Nature Club. He doesn’t mean to pick on mountain bikers; in fact, what he discovered is that hikers with dogs are also formidable wildlife disruptors. In dog-crazy communities, of which the Greater Yellowstone Ecosystem has an abundance, people who head with their domestic canines into the forest with them need to be aware of the impacts they are causing. A single hiker walking down a trail causes wildlife displacement of 150 feet. 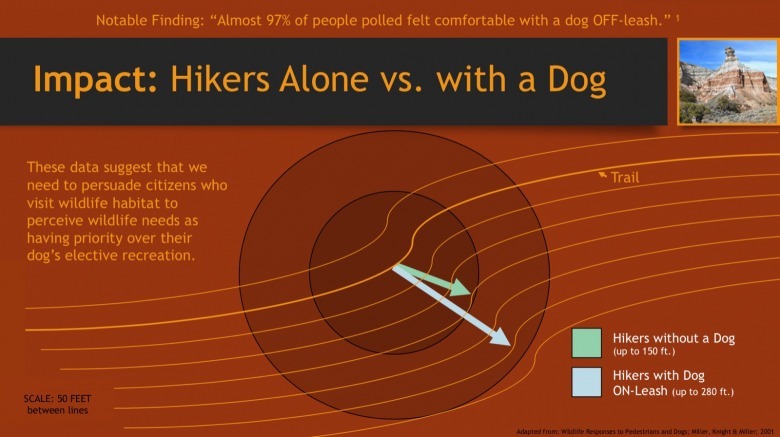 But a hiker with a dog on leash results in a wildlife displacement of 280 feet in one direction. When the panoramic radius on both sides of the trail is combined to create total diameter, it means a zone of 560 feet. It’s one thing if the displacement causes an animal to flee and it is able to return to its preferred habitat after the person and dog are gone, but the disruption can become chronic, if not permanent, when the trail receives a stream of near-constant or heavy use. The displacement comes at a cost, not only by the stress it causes and amount of energy expended by the animal to leave, but it might mean abandoning the prime places where it finds the best forage and security cover, Thompson says. Such scenarios are playing out across the Greater Yellowstone region, he adds. Often, mountain bikers insist they are no more disruptive to wildlife than hikers and equestrians, Thompson says. The problem is that riders travel faster and cover much longer distances than hikers; they tend not to make noise; riders while navigating trails are more concerned about avoiding rocks and trees than being fully attentive to their surroundings, and the way they ride makes their presence less predictable, he says. If a single mountain biker is traveling twice the distance as a hiker, then it could be argued, Thompson says, that the cyclist is having twice the spatial impact in terms of potential wildlife disruption. And, with rising numbers of mountain bikers and local clubs pressuring the Forest Service to let them upgrade and build new trails, the impacts are hardly benign. Here is a summary of federal and state statutes pertaining to free-roaming dogs seen harassing wildlife and livestock. Some recreationist have proposed that Greater Yellowstone land management agencies develop an expanded network of trails, open up wilderness lands to mountain biking, or not protect areas if their uses aren’t allowed. They point, for example, to how federal agencies have accommodated mountain biking advocates in the Sierras, Utah and the Colorado Rockies. No user group likes being called out. Thompson in his presentation noted that most recreationists tend to blame others for causing impacts to wildlife rather than holding themselves responsible. 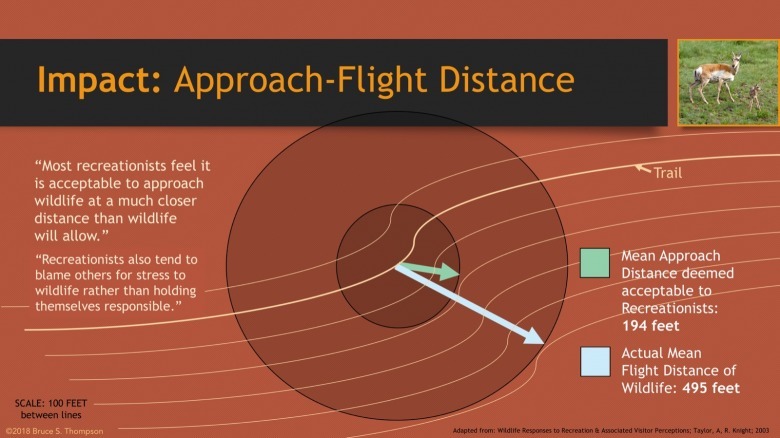 One of his slides pointed out the mean distance recreationists accept as being respectful to wildlife is 194 feet, but the mean flight distance for wildlife is 495 feet. Cache Creek east of the town of Jackson illustrates neatly the conundrum. Several different trails, approved by the Forest Service, snake into the drainage, accommodating all manner of users ranging from hikers, runners and dog walkers to mountain bikers. No studies are needed to further confirm Cache Creek’s importance as habitat for moose, elk, deer, black bears and even mountain lions. Most poignant, it is used as a refugia by cow moose and elk with calves and pregnant females giving birth in the spring. As Thompson says, imagine each user, in particular those with dogs, as pulses of bubbles moving up through the drainage, displacing wildlife they come in contact with. 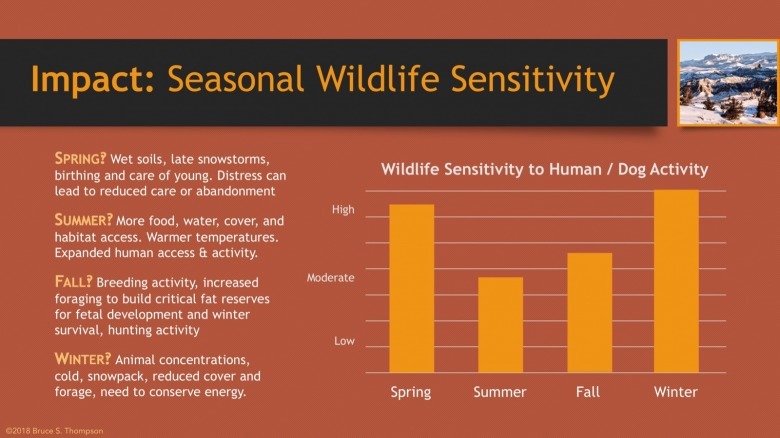 Although there is currently a study aimed at assessing the impacts of current use levels, biologists acknowledge wildlife has already been negatively affected. With proposals to expand the trail network to the other side of Snow King Mountain, into known winter range for mule deer and other animals, many are wondering if the Forest Service has the will to hold the line in protecting habitat. Both the Custer-Gallatin National Forest, headquartered in Bozeman, and the Bridger-Teton are presently involved with updating their long-term management plans. Part of the process is proscribing the kinds of recreation uses and their expected levels of intensity. Significant scrutiny is being directed toward the Custer-Gallatin and its management of the 155,000-acre Hyalite-Porcupine-Buffalo Horn Wilderness Study Area that, ecologists say, contains incredible wildlife diversity and superior habitat in the Gallatin Mountains between Yellowstone and Bozeman. 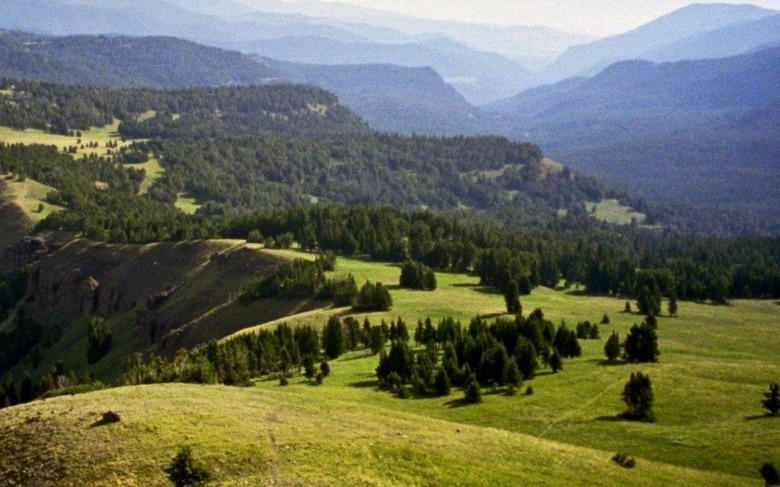 In 1996, conservationists sued the Forest Service for allowing motorized recreation, mountain biking and illegal trail building to occur in the Hyalite Porcupine-Buffalo Horn, ultimately resulting in a settlement in 2001 that forced the Custer-Gallatin to assemble a travel management plan. Illegal trespass by motorized users and mountain bikers remains a persistent problem in the roadless Gallatin Range, which scientific researchers Lance and April Craighead identified as being among the most important habitat for wildlife. The list of denizens includes grizzly bears, the famous Gallatin elk herd, moose, bighorn sheep, wolves and other species in the center of the ecosystem immediately abutting Yellowstone. The Hyalite-Porcupine-Buffalo Horn contains a quality of wildness, in terms of animals, that surpasses that of most national parks says advocates involved with Montanans For Gallatin Wilderness. It is even eyed as a potential sanctuary Yellowstone bison desperately in need of rangeland outside America's national park. The Craigheads strongly recommended, based on their research, that the Hyalite-Porcupine-Buffalo Horn should be protected from further human alteration and disturbance. This protection should be as restrictive of human uses as possible and should be as permanent as possible." How much consideration are the Custer-Gallatin and Bridger-Teton giving to wildlife persistence now and the decades to come? What is the science telling them about the impacts of human intrusion? Are they factoring in the fact that secure habitat will become ever more crucial for wildlife as species deal with the combined effects of more people and climate change? The effects of habitat fragmentation were featured in a recent scientific report prepared by researchers Andrew Hansen and Linda Phillips at Montana State University. They are undeniable. Linda Merigliano, the B-T’s recreation and wilderness program manager also recently held an informal meeting with wildlife conservationists, scientists and users. Is Greater Yellowstone Really Ready To Confront Its Future?